When oven space is at a premium, this stacked stainless-steel rack saves the day. 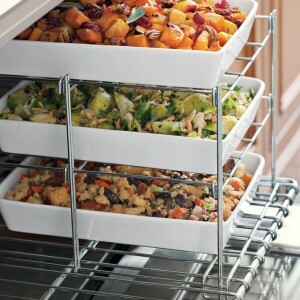 Place it on one half of an oven rack and bake several side dishes while the main fare cooks alongside. It also folds flat for convenient storage. Maximizes oven space for multiple roasting and baking tasks. Ideal for entertaining and preparing large batches of food. Accommodates bakeware up to 4″ high. Holds up to three levels of heavy casseroles.